These days, the word “magical” is often overused when defining a place or an ambiance, however, Costa Rica’s Monteverde (meaning ‘green mountain’ in Spanish) truly lives up to this description in every way. Monteverde sits on top of the continental divide high on the Tilarán Mountains, in the Puntarenas province in northwestern Costa Rica, about a three-and-a-half hour drive from either San Jose or Liberia. The continental divide is the ‘spine’ of the Americas, and spans from the Rockies in Canada, through Central America, and becomes the Andes Mountains in South America, reaching down to Patagonia at the bottom of the continent. It is the mountain range which separates the rivers that run towards either the Pacific or the Atlantic Ocean/Gulf of Mexico. Of course, you are not going to see snow-capped mountains in Costa Rica, but the elevation of Monteverde (4662 feet, 1440 meters) will have you scrambling for a hoodie and jeans once the sun sets. Being on top of the continental divide is magical in and of itself, but couple that with a cloud forest and you have the makings of something pretty spectacular. 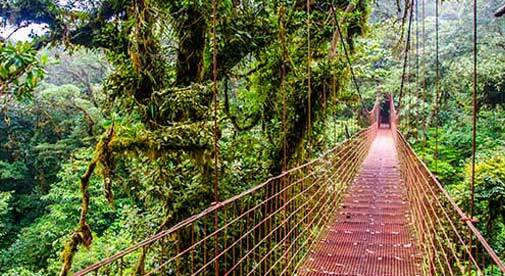 Cloud forests are quite rare—covering only 1% of the woodlands in the entire world. They are given this name because the forest is almost always enshrouded in clouds or misty fog. These low-hanging clouds cling to a tropical canopy as they condense onto the leaves and drip to the plants below, keeping everything wet and green. These fascinating biodiverse forests exist within tropical and subtropical mountainous areas, where the atmospheric conditions create this phenomenon. In the case of Monteverde, the currents come from the Pacific Ocean on one side and the Caribbean Sea on the other, although the cloud forest is hours from either coast. If you enjoy birding and wildlife, Monteverde will not disappoint. Monkeys, toucans, sloths, a variety of cats, and tapirs all live within the cloud forest. Along with all kinds of creepy crawly critters. Monteverde has an unusual settlement history. In the late 1940’s a group of Quakers from Alabama were uneasy about the expanding military industry in the U.S. and discovered that Costa Rica had recently abolished their army. Forty-four of them, totaling 11 families, moved to Costa Rica in late 1950 to scope out this new land. They eventually settled in Monteverde and bought a 3,500-acre tract of land. They were adamant about preserving the watershed and the forest (Monteverde now has three national cloud forest reserves) and brought with them their skills, such as education and cheese making. The Monteverde Cheese Factory, to this day, is known throughout Costa Rica for their quality cheese and ice cream. There is still a small contingency of Quakers in the area, and a number of international expats have followed their example—finding the charm of this cool, mountainous, magical place to suit them. The population of the Monteverde area (including the enchanting and easily walkable town of Santa Elena) has approximately 6,500 residents now. Including a mix of gringos and ticos. You can live life here without having to leave the mountain very often, as you will find grocery stores, clinics, banks, gas stations, and all the basics you need for day-to-day living. Tourists have also found the uniqueness of this biodiverse natural area. From canopy hikes to zip lining, coffee and chocolate tours, butterfly gardens to bat jungles, there is something for everyone in Monteverde. Plus, if you are still working on your Spanish, the local population has excellent English skills, since they cater to many tourists. Monteverde. In a word? Magical.